Are you all aware of the "sleeveface" phenomenon? I was not. That is, not until Ward and friends over at Middlebury College's WRMC 91.1 introduced me by way of their blog. Which you should check out. It's relevant, updated often, and has a background of colors much too bright, but adorable in its own private-school-dance-party kind of way. Plus the writers all have cute shoes and apparently no shirts. Anyway. 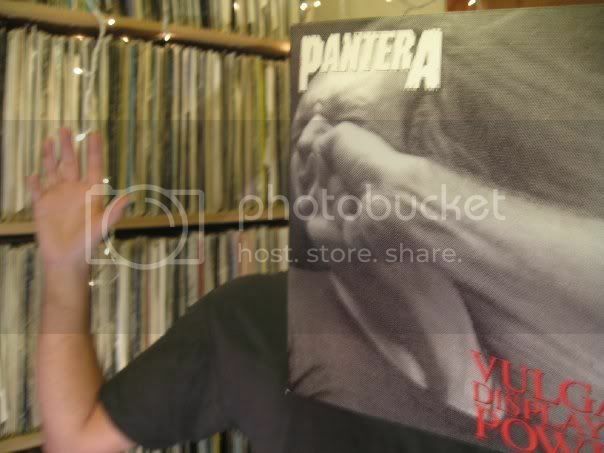 Sleeveface occurs when an individual uses a record sleeve to obscure his or her face. Simple? Yes. Awesome? Suprisingly, also yes. Following the links from the WRMC blog, I found a facebook group, a flickr group, and of course, the homepage for the movement, www.sleeveface.com. How about you kids? Anyone have a sleeveface to share?